While this recipe doesn't require much preparation or work it does require time to cook. The longer you can cook the sauce... the better the results! So try it on a winter's day when you're staying in and you can just leave it to slowly cook on the back burner. Since it takes such a long time to make, why not make a large batch and freeze some? It will probably take you about 15 - 20 minutes to prepare the ingredients and start the cooking process. You will then need to leave it to cook slowly over a low heat for at least 2 -3 hours although I tend to leave it for about 4 hours! There are possibly more variations on this sauce than any other but this is my absolute favourite way to make it! It is much more common to make this dish with minced meat - which will allow you to reduce the cooking time. When I make it with mince I would often use a mixture of pork, beef and veal but it's probably more common is just to use one type of meat. If using mince meat, I would suggest you ask your butcher to freshly mince the meat for you or mince it yourself if you can. Personally, I prefer to use shin beef in my interpretation of this recipe and to simply chop it into small pieces rather than mince it. I feel this gives it a more rustic texture and it also lends to a longer cooking time which I feel gives the best result. I suppose it's somewhere between a meatball sauce and what people term Bolognese sauce. In addition to the main meat, there are also some who use chicken livers which give the dish a richer flavour. While others also add pancetta, mortadella or prosciutto. Strictly speaking, garlic is not traditionally added in this recipe but I tend to add a few cloves. Others will also add mushrooms and even cream. Then there are those who add any combination of chilli, Worcestershire sauce, rosemary and sage. So, while many Italians disapprove of those who stray from the traditional recipe, I feel cooking should be all about experimenting with new ideas and flavours and as such feel that variations on the original should be encouraged!! You need to cut up the piece of shin beef into small bite size pieces. The exact size is up to your own taste although the bigger you leave the pieces the longer it will need to cook for. You will also need to finely chop the onions, carrot and celery as well as garlic if using. To begin, as with many Italian recipes, you need to make the Soffritto. This is the slow cooking of the finely choped celery, carrot and onion in olive oil until soft. Add the garlic too at this step if using. Once soft and the onion is translucent add the meat and brown. Once the meat is brown add a dash of wine if using and let reduce down before adding the tomatoes and bay leaf. Let it just about come to a boil before reducing the heat and leaving to simmer over a low heat. Check the sauce every 25 minutes or so and stir. Use your judgement, if it is becoming too thick and dry and yet the meat is not yet tender you may need to add some more tomato or even some stock. 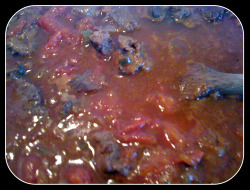 After about 2 -3 hours or more depending on the size of the pieces of meat, the sauce should become thick and the meat should become so soft it almost falls apart when pressed. Add basil and seasoning to taste then serve with pasta or use as your filling in a lasagne. This sauce is traditionally served with Taglitelle (not spaghetti!!). I also use this sauce for a meat lasagne though. Other than those mentioned above, this recipe is also broadly similar to the recipe for the Tuscan dish Peposo (essentially a beef stew). Simply replace the tomatoes with stock and red wine and add rosemary and lots more black pepper. While this dish is often traced back to Bologna, the term "Bolognese" sauce is not one that is used in Bologna where it will be referred to as "Ragu".